It's important to understand what makes a good leader if you want to be a successful Project Manager. There are countless books about leadership, each with its own view of what leaders should do to be successful. Many of these books will list 10, 20, or even more key leadership characteristics or principles. Reading and studying these books is important for developing good leadership skills. But it's not very realistic to expect that you will be able to remember and apply that many principles on a day-to-day basis. Fortunately, there is a more practical mindset that you can use to lead your projects effectively. "Great leaders rally people to a better future." These two quotes are great because they get to the essence of leadership. Examining these two quotes, we can see that there are two key characteristics of a good leader. To be a good leader you have to be forward looking - able to imagine what could be. Creating this vision of a "better future" is the rudder for your team or organization. This is what you will use to keep your team working in a coordinated manner. However, it's not enough to simply have a vision of the future you'd like to see. Your vision needs to inspire your team. 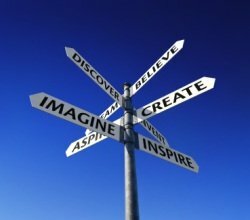 Why is creating the future you envision important? How does your specific project contribute to "making something extraordinary happen?" As a leader, your primary focus should be on people. Enabling people to act is a continuous process, taking place long before any specific vision or project is even thought of. Building relationships begins this process. You want to develop relationships of trust and confidence. Setting the example, communicating openly, and following through on your commitments are some ways you can build these types of relationships with others. Relationships of trust work in both directions. Not only do you want others to trust you, but you need to trust others. This will give you the confidence you need to empower your team to take the actions necessary to create your team's shared vision. Once your team has a common vision they are working towards and are empowered to take the steps to reach that vision, your job is to make sure they have what they need to get there. That can come in the form of executive support, systems and tools, or simply staying out of their way so they can get the job done. First, give your team a reason to come into work energized each morning by creating a shared vision that they can be excited and proud of creating. Second, make sure your team has the tools they need and are empowered to take the necessary actions to make that vision a reality. You can find more articles about what makes a good leader below. Leadership versus management. Is one more important than the other for successfully managing projects? 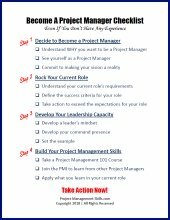 Learn the difference between leadership and management and how it applies to project management. The Situational Leadership Model provides guidance on what type of leadership style to use and when it should be used. Learn how you can influence people you don't have direct authority over.